Noted for designing Asheville’s Jackson Building, the region’s first skyscraper, E.A. Jackson built the house for his daughter in 1925, replete with a rolled-edge roof and round-top door. Though the home had only two owners prior to the Bankses, it had slipped into a dreadful state and required extensive renovation, with the kitchen and bathrooms demanding the most attention. Given the home’s historical significance and location in the nationally registered Grove Park Historic District, Conner-Murphy and the team were challenged to maintain the architectural integrity of the home while offering modern amenities and energy efficiency. They did that by updating the home’s mechanical systems and keeping as many period details as possible. 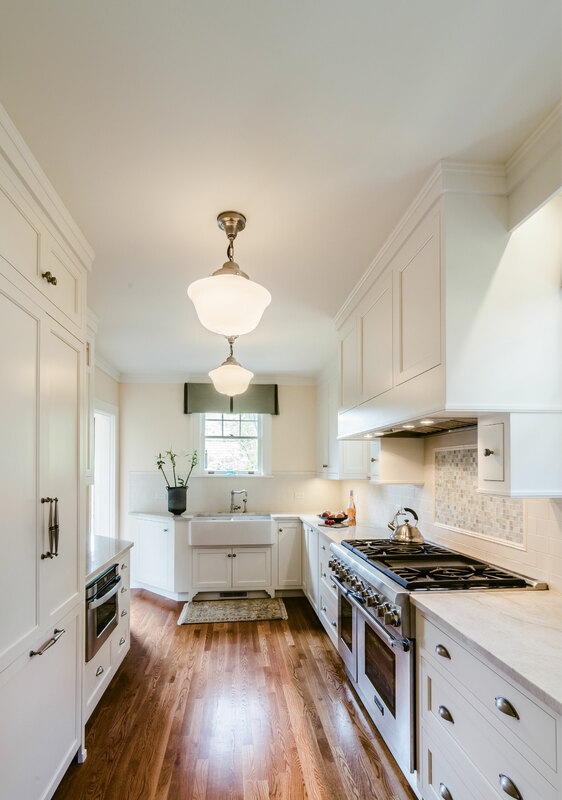 For example, windows were restored rather than replaced, and Shaker kitchen cabinetry and antique pewter hardware were chosen to reflect the period, lending a look that’s as timeless as the home itself. 1. Redesigned the kitchen and breakfast nook to create a large galley kitchen with modern appointments and appliances. 2. The master bath was redesigned with period styling to accommodate a large shower and dual sink vanity. 3. The entire interior was renewed by refinishing the wood floors, repairing plaster, painting, and adding period-style lighting. 4. The exterior was refreshed with paint and copper gutters that are exact replicas of the originals. 5. The overgrown landscape was cleared and redesigned to open up the property and allow natural light into the home once again. With their children out of the house, Tracy and Scott Buchanan, both executives at CarePartners in Asheville, found themselves re-evaluating their nest. 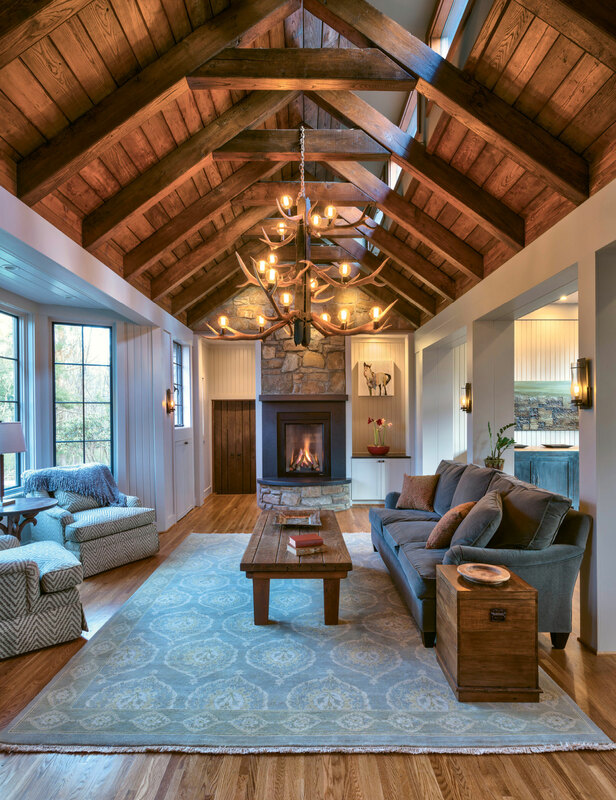 Yet, having spent 22 years raising their family in the 1920s fieldstone house in Asheville’s Bent Creek neighborhood, they opted to stay put, and worked with Nathan Bryant and Brooke Tate of Samsel Architects to transform the home into one they could live in for the long haul. As a compromise, a large portion of the house adjacent to the kitchen was demolished so the kitchen could be expanded in that direction. The dining room was moved for a better flow, and even the living room received an air of openness with the addition of a bay window. The tree stayed, and thanks to help from an arborist, is in even better condition than it was before. 1. Doubled the size of the kitchen to provide better circulation and installed expansive windows for more light. A screened porch now extends off the kitchen. 3. A bay window was added to the narrow living room to make the space feel bigger. 4. A new front porch that harkens to the era of the original structure was added for protective cover and to offer a more inviting entry. 5. Great care was taken to protect and improve the longevity of the massive oak tree out back, a defining characteristic of the property. McAulay offered a proposal that involved using barnwood in a contemporary aesthetic, and hit the jackpot when he purchased some 1,500 linear feet of reclaimed oak and locust from Olde Town Salvage in Leicester. He and his team, Brad Migyanka and Red Deer Cruz, used it to build a bedroom shelving/nightstand unit, bathroom vanity, and sliding door in the living room, and to accent the doors and windows throughout. Even the wood scraps were used in the mosaics over the windows. Leslie Huntley of Roost Interiors developed concepts for lighting fixtures and furnishings, and Anna Krauss put her faux finish painting skills to work bringing the barnwood look to the doorjambs, window trim, and kitchen cabinetry. The result is a comfortable home with a strong touch of artistry. 1. Three bathrooms were renovated and updated, and a master closet was reconfigured for more space and functionality. 2. The popcorn ceiling and Parquet flooring were removed. 4. The kitchen cabinets were made new with a faux finish, as were the window trim and doorjambs so that they blended with the wood molding. 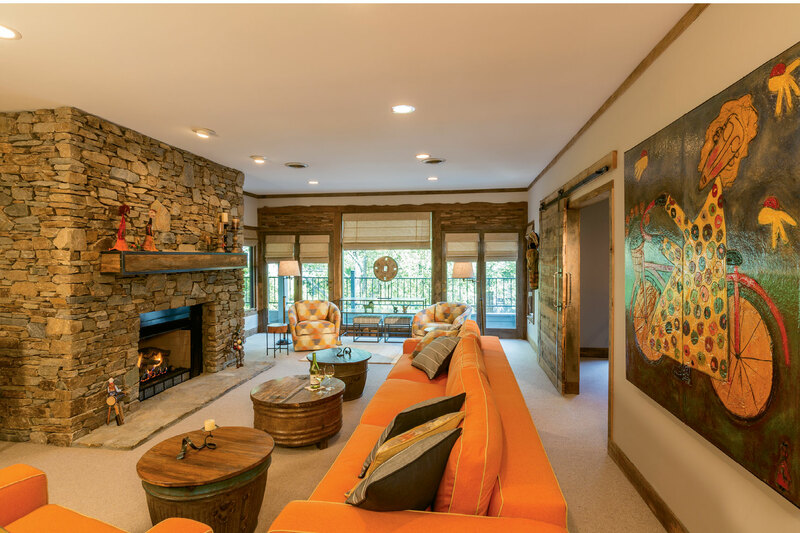 When Cincinnati residents Larry and Kim Juran were looking for a second home in Asheville, they knew they wanted a house near downtown with a view and found just the place on Town Mountain. However, like many of the homes that sit on this commanding ridge east of the city, “it was built during a time when construction methodology was not the greatest,” says architect Rob Carlton of Carlton Architecture, who the Jurans hired to update the 1970s dwelling. The floor plan was haphazard, with the main entry on the lower level opening to an office and stairs that ascended squarely into the center of the upper living area, awkwardly dividing the space. “There was even a bathroom door opening into the dining room,” says Carlton. The project required major demolition to open the upper level and create a modern layout, though Carlton says the house was set up nicely for the overhaul. “The structure has a simple form and had not been modified with bad renovations.” With a fresh, open floor plan, a master suite added to the upper floor, expansive windows, a new deck, and bright burnt orange exterior paint, the home is as spectacular as the view. 1. Downstairs, one of four bedrooms was sacrificed to expand the foyer, the stairs were relocated, and a dumbwaiter for hauling in groceries was added in the garage. 2. Upstairs, the kitchen, dining room, and bathrooms were reconfigured to create an open, modern layout. 3. The fireplace was resurfaced with steel panels and flanked by white oak cabinetry. 4. A master suite, utility room, powder room, and pantry were incorporated into the upstairs footprint. 5. Windows were replaced throughout, with the upper level receiving new floor-to-ceiling views. 6. The wood deck was replaced with a steel structure that offers unobstructed westward views. 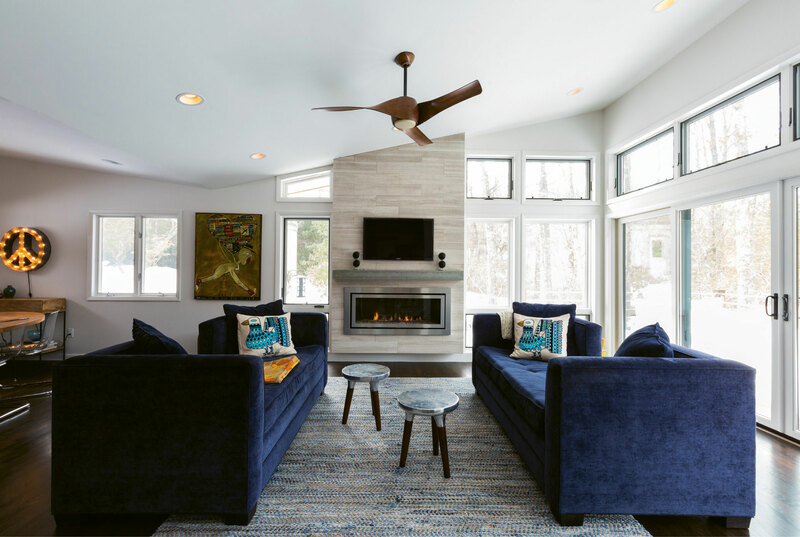 Scott Kaysen and Julie Chavez’s vacation home in a forested community near Brevard went from a demure 1970s rancher to a mid century modern-inspired beaut. The key to their success? They raised the roof. 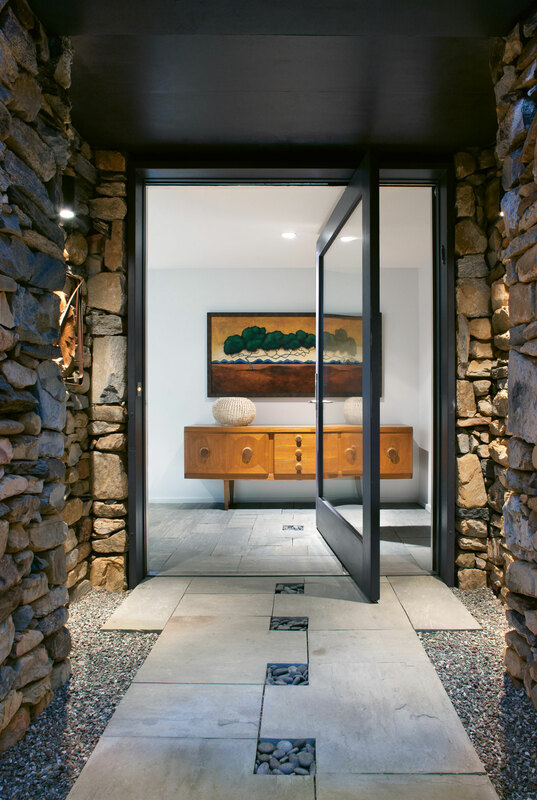 The house had an understated entry, minimal windows, and eight-foot ceilings that resulted in a dark interior, explains architect Peter Tart. Adding a butterfly roof gave the house breathing room and increased the opportunity for expansive windows. It also helped make the approach feel more welcoming. The kitchen received an extensive renovation as well. “It was a terrible 1970s kitchen,” says Tart. “Back then, kitchens were used for utility and weren’t places for gathering.” His team opened up the entry from the living room, increased the size, and added skylights. A wall concealing access to the downstairs was redesigned so that a half wall is neatly incorporated into the kitchen layout. And the downstairs, which Tart says “was like a netherworld,” now benefits from the skylight too. 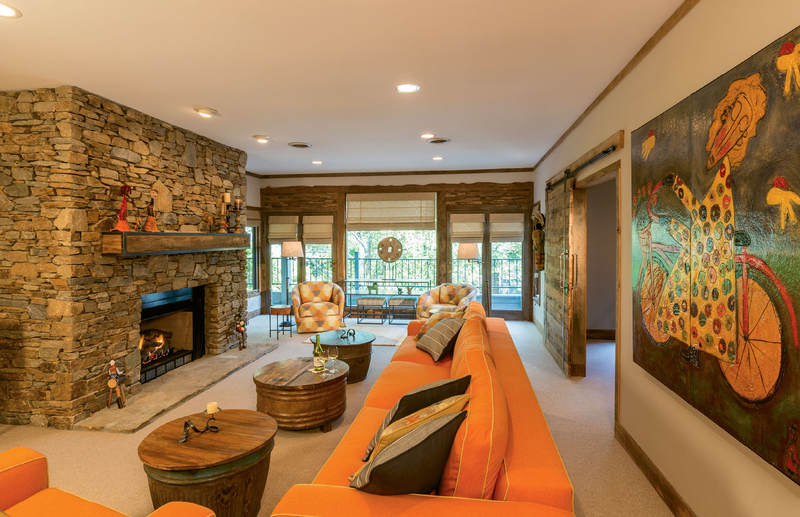 Renovations in the master bedroom and baths helped make this a dream getaway for the Charlotte couple. There’s even has a domed observatory on the property—but that’s a project for later. 1. Increased the ceiling height by introducing a butterfly roof that allowed for larger windows and broader views of the surrounding forest. 2. Expanded the roof to cover the entry and better integrate the porte cochere into the overall design. The soffit’s natural wood color is a warm touch. 3. The kitchen ceiling was raised, and skylights were added. The space was lengthened, and the entry from the living room enlarged. Access to the deck was improved. 4. Previously accessed via a dark hallway adjacent to the kitchen, the lower level was opened up by tearing down the door and wall, and placing the skylight over the stairs. 5. The master bedroom received larger windows to better connect with the outdoors, and the bathrooms were remodeled.